For a long time, I have been fascinated with the traditions of November 1, the day after Halloween. In the U.S., Halloween is a holiday where children dress up as ghouls and goblins and trick-or-treat for candy on October 31. But in Sicily, the land of my ancestry (and many other countries), it is the day after Halloween that is celebrated. 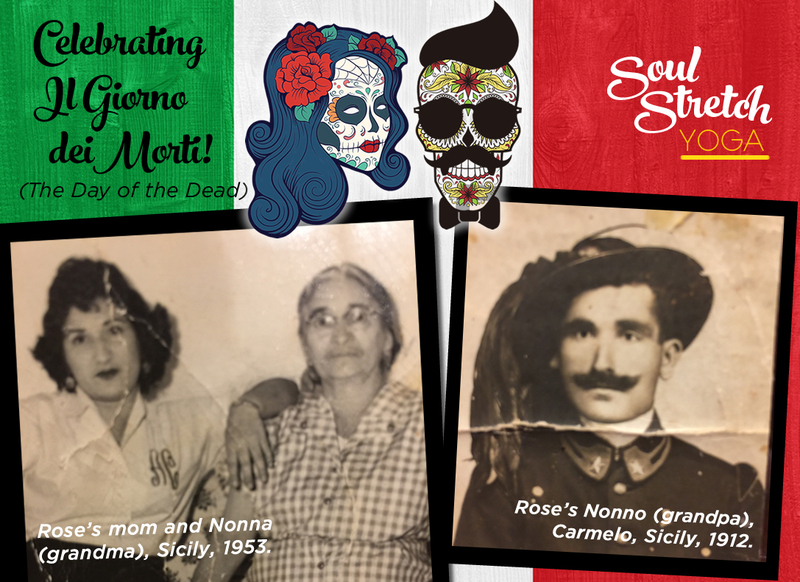 In Italy, November 1 is known as ll Giorno dei Morti, or the Day of the Dead. It’s a national holiday, with schools and businesses shut down; everything is at a standstill. The entire day is devoted to the memory of loved ones who have passed on. Celebrations begin at dawn with a mass to honor and pray for the dead. Families go from church to the graveyard, where they bring bunches of flowers to place on graves. No grave site, crypt or tomb is left untouched; all are decorated with big, bright chrysanthemums, which are at their peak in autumn. The cemeteries become canvases of orange, crimson and gold, a blanket of color. Then families gather at home for a sumptuous meal. A candle is placed in a front window as a beacon for the spirits to find their way back, and an empty place setting is left at the table to encourage the spirits to sit and stay a while. Cakes, nuts and candy are left for the spirits. Families feast upon Italian comfort food such as hearty bowls of Zuppa Ribolita, steaming plates of hand rolled pasta in wild boar ragu, and savory garlic crostini topped with sautéed porcini mushrooms. Everything is washed down with a robust local red wine and accompanied by an assortment of cheeses from a local dairy. The meal is capped off with tiny cups of espresso and Ossa dei Morti (bones of the dead), a crunchy dunking cookie made of cinnamon and almond paste and rolled into logs to resemble bones…hence the name! In 2000, I went to Sicily with my mom to visit family, and I was able to participate in this beautiful tradition. Being raised in the U.S., we had never celebrated the Day of the Dead nor did we ever visit grave sites of loved ones once the funeral was over. At first, I found the Italian Il Giornio del Morti somewhat strange. For example, in Italy all the graves have laminated photographs of the deceased glued right onto the headstones, so visitors can place a name to a face. I also wasn’t used to going to a cemetery except for a funeral, a time of grief and deep sadness. Absent such feelings, my Italian family was able to reconnect with loved ones at the cemetery and remember them with absolute joy in their hearts. Il Giornio del Morti is by no means a morbid affair. It’s a happy celebration with a focus on food, faith and family. For many Italians, the grave site vigil is an occasion to reconnect with and thank their ancestors. It is a chance to acknowledge and celebrate their lives, even if many years have passed since they walked the earth.